Two cannabis “gardeners” tending a £1m drugs factory were “expendable” links in a criminal network, a court heard. Their solicitor said the men had been victims “at the bottom of the chain”. Jeremy Kendall, mitigating, said they had played “a lesser role”, having been asked to tend the plants and avoid attention. 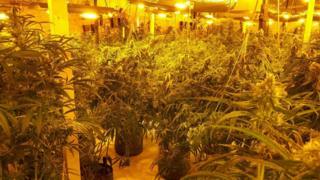 When police searched the unit they found “cannabis production on an industrial scale” with hundreds of mature plants, and sophisticated lighting and ventilation equipment.